Dealers with their displays full of numismatic and collectible items filled the March 2015 Greater Atlanta Coin Show's bourse for each other's and the visitors' pleasure. The March show enjoyed a spring teaser of a day with mostly sunny skies and temperatures in the mid-70s. Once again, the sports memorabilia show set up in the space adjacent to the coin show. This month, they had Otis Nixon, of the Braves, signing autographs. Many visitors packed the bourse while they browsed the many displays or searched for that perfect treasure to add to their collection. Sometimes numismatic interests change over the years. Coin collecting and coin shows offer the opportunity to sell or trade one type of numismatic collectible for another. In addition to their displays, the dealers offer free verbal appraisals and buy collectibles at the coin show. Some visitors did bring items to sell. For example, one collection included a nice selection of certified early buffalo nickels in high grades. The Mint produced the buffalo nickels from 1913 to 1938 and have used the design on the 2001 American Buffalo Commemorative Silver Dollar and on the American Buffalo gold bullion coins beginning in 2008. Let's take a look at some other examples on the March bourse. One display included a nice 1869, 9 over 9, Indian head cent, uncertified. The US Mint struck the Indian Head cent from 1859 to 1909 when they changed to the Lincoln cent to honor the 100th anniversary of Lincoln's birth. Per the Red Book for the 1869 cent: "The 9 is doubled on some varieties of the 1869; on others it appears to be over an 8, although it is actually a doubled 9. None of these varieties is a true overdate." The 1869, 9 over 9, Indian head cent varies in value from just under $100 in Good condition to values in the four digits with higher Mint State certifications. 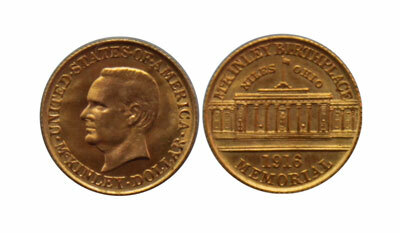 Another raw (uncertified) coin on the bourse was a classic commemorative 1916 McKinley gold dollar. The obverse includes a left-facing portrait of McKinley with the reverse showing a view of the McKinley memorial in Niles, Ohio. The sale of the McKinley gold dollar in 1916 and 1917 helped pay for the memorial built to honor the McKinley at his birthplace. This particular coin was a 2008W Burnished example in a PCGS MS-70 certification holder noted as a Reverse of 2007. Per the Red Book: "Reverse dies of 2007 and earlier have a plain U in UNITED. Modified dies of 2008 and later have a small serif at the bottom right of the U." MS-70 - The perfect coin. Has very attractive sharp strike and original luster of the highest quality for the date and mint. No contact marks are visible under magnification. There are no noticeable hairlines, scuff marks or defects. Eye appeal is attractive and outstanding. In simpler words, this American Silver Eagle is a pretty coin. Of course, there were many more coins on the bourse, each with their own stories to tell and their own characteristics to pique the interest of the visitors to the coin show. Mark your calendars for the next Greater Atlanta Coin Show on Sunday, April 12, 2015 in the Joe Mack Wilson ballroom. At less than 0.05 troy ounce of gold, this coin's value ranges from the low to mid three digits ($300-500) to the low four digits ($1000-2000) depending on its grade. 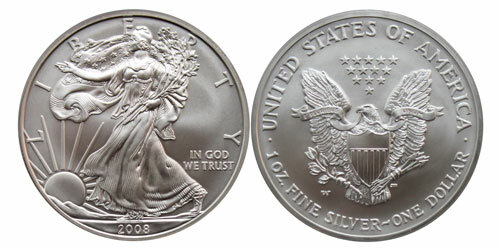 Another more modern coin found on the bourse was of the American Silver Eagle variety. 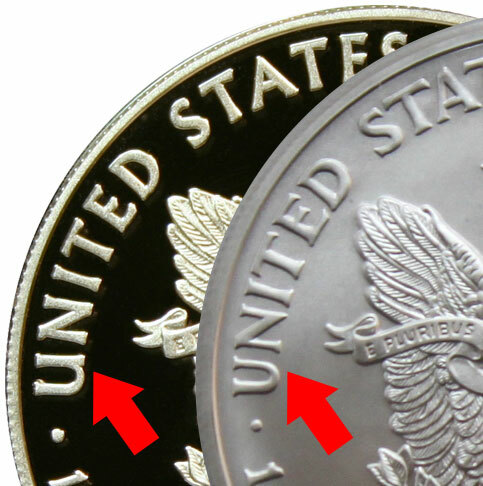 Of the over 21 million American Silver Eagles minted in 2008, less than three percent were burnished. Of that population, the Mint struck roughly two-tenths of one percent with the Reverse of 2007 dies. And, of those estimated 47,000 2008W, Burnished, Reverse of 2007, how many can claim MS-70 status?